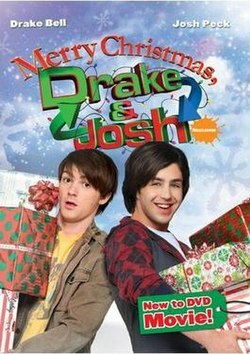 Merry Christmas, Drake & Josh (also known as Drake & Josh: Best Christmas Ever) is a television movie based on the Nickelodeon sitcom Drake & Josh. Drake Bell, Josh Peck, Miranda Cosgrove, Nancy Sullivan, and Jonathan Goldstein reappear as their respective characters, with several recurring characters from the TV series also reappearing. The film premiered on December 5, 2008, as a Nickelodeon Original Movie. It was the third most viewed TV movie on cable behind High School Musical 2 and Wizards of Waverly Place: The Movie, both owned by Disney Channel. Shortly before Christmas, Walter (Jonathan Goldstein) and Audrey (Nancy Sullivan) decide to leave home for a tropical vacation. Their children Drake (Drake Bell) and Megan (Miranda Cosgrove) come home while Josh (Josh Peck) shows them his snowman air balloon decoration, which Megan sabotages. Later at the mall, Drake tells Josh that he will be throwing a Christmas party on the roof of his workplace the Premiere, which Josh is unsure of, but Helen (Yvette Nicole Brown) approves. Helen then hands Drake a Santa costume to wear in the mall. While hiding from a woman looking to kiss him, Drake meets a little girl named Mary Alice (Bailee Madison) who says she and her family want the best Christmas ever. He makes an unbreakable promise that he will make it so. At the party, Josh's co-worker Crazy Steve (Jerry Trainor) shows the two pictures of his favoured wood chipper "Sally". Craig (Alec Medlock) and Eric (Scott Halberstadt) suggest to Drake that he perform a song in the upcoming Christmas parade, but Drake explains that he will be in Las Vegas at a concert. Later on, some party crashers show up whom Josh calls the police on, but he falls off the roof after they arrive during a mix-up, landing in the back of a pickup truck with the police trailing close behind, eventually rolling out only to be arrested. In jail, he meets his cellmate, Bludge (Kimbo Slice). At first, Bludge tries to beat him up until Josh entertains him with magic tricks. Knowing he must fulfill his promise after Mary Alice tells him about her sick foster mom and busy foster dad, Drake attempts to break Josh out to help him, only to get caught and arrested. Drake and Josh are sent to court, with Helen acting as their lawyer. She informs Judge Newman (Henry Winkler) of Drake's promise to Mary Alice, who decides that they will not be sent to jail as long as they fulfill it. Afterwards, they meet their cruel and embittered parole officer Perry Gilbert (David Pressman), who says that he will hold a vote with Mary Alice's family asking if they had the best Christmas ever. If any of them say "no", they will go to jail. The duo soon meet Mary Alice's foster family, which include frequently feuding twins Lily and Violet (Camille and Cosette Goldstein), Zigfee (David Gore), a foreign boy who speaks an unknown language, know-it-all Trey (Daven Wilson), and Mary Alice's rebellious, loner older brother Luke (Devon Graye). They find many possibilities to give the family the best Christmas ever, but their attempts are foiled by Officer Gilbert. Drake and Josh enlist Megan's help to sabotage Officer Gilbert's doings by bribing her with Trevor's rare Smith Royal oboe; however, she stops upon discovering it was an empty bribe. Josh then visits Officer Gilbert's mother, who explains that as a child, Officer Gilbert always wanted a pet chimpanzee for Christmas. When he found one sitting in a cage by the tree and opened the cage door, it attacked him, causing him to hate Christmas ever since. Drake and Josh realize that since Christmas was ruined for him, he wants to ruin it for everyone else. Drake and Josh eventually decide to take Mary Alice's family caroling; however, nobody in their neighborhood listens to them. The group decides to put on a concert, performing a rock rendition of 12 Days of Christmas, which the entire family, even Luke, loves so much they decide to perform it in the Christmas parade. At the parade, Officer Gilbert tricks Crazy Steve into loudly reminding the duo in front of Mary Alice that they will go to prison if they do not keep their promise. Believing they were only being nice to avoid punishment, Mary Alice and her family leave. Despite the family's anger towards them, Drake and Josh are determined to keep their promise. Meanwhile, they also send Officer Gilbert a nice chimpanzee as a Christmas present, which causes him to begin loving Christmas again. They then borrow Steve's wood chipper to make it snow in front of Mary Alice's house by putting ice in the machine, but it inadvertently shoots large chunks towards the house. After the machine knocks both brothers unconscious, Officer Gilbert brings them home. The brothers enter the living room the next morning, where Mary Alice's family surprises them, having learned from Officer Gilbert that the two were not actually using them to stay out of prison. The vote is held, with everyone voting "yes". Drake and Josh probation is over and charges are dismissed. Bludge, dressed as Santa, then comes down the chimney to deliver gifts to everyone, including a Smith Royal oboe for Megan. Josh's girlfriend Mindy, who had left town for the holidays, arrives too after hearing about everything that happened, and Steve gets "Sally" to make snow by using 7,000 pounds of hard cheese. Drake and Josh's parents then arrive home from their troubled vacation at their "bungalow", which was blown away earlier in a tropical storm. As everyone plays in the blanket of "snow", they truly have the best Christmas ever. The show's vast majority of recurring characters returned for the special, all played by their original actors. Crazy Steve takes a more major role in this film, having a larger role in the film than Audrey or Walter. These characters all have a larger role than most characters, second only to Drake, Josh, and Megan. The opening theme for the movie entitled "Christmas Promise" was composed and performed by Drake & Josh series composer Backhouse Mike. Miranda Cosgrove did a cover of "Christmas Wrapping", and the song became the single of the movie, but no soundtrack was released. The cast featuring Drake Bell, Josh Peck, and the kids do a cover of "12 Days of Christmas" in the movie. Drake Bell made a music video for his cover of "Jingle Bells" which promoted the movie and can be seen on the DVD. The film was released on DVD on December 19, 2008. The premiere of Merry Christmas, Drake & Josh had 8.095 million viewers. ^ Laura Griffith (December 5, 2008). "Native makeup artist works holiday magic on 'Drake and Josh' movie". The Telegraph. Alton, Illinois. Archived from the original on January 3, 2009. Retrieved 2008-12-06. ^ Robert Lloyd (December 5, 2008). "Drake & Josh: Take 'em or leave 'em". Los Angeles Times. Retrieved 2016-03-12. ^ Robert Seidman (December 9, 2008). "NFL, Drake & Josh, The Librarian, WWE Raw and Leverage lead cable". TV by the Numbers. Archived from the original on January 3, 2009. Retrieved 2009-02-18.